We provide custom porch design options to suit every home and budget. Whether you're looking for a front porch or a screened-in porch, Outback Deck Inc. uses only the highest-quality materials to build your porch exactly how you want it. From classic wood to maintenance-free porches, we ensure a seamless match to your home's exterior. Call us at 844 326 5713 or click below to schedule a no-obligation design consultation and we will provide our expertise towards for your porch installation project. We proudly serve Roswell, Alpharetta, Marietta and surrounding areas. At Outback Deck Inc., we pride ourselves on guiding our consumers through the process of design. We take time to engage the conversation; we ask questions, provide feedback, and communicate in a way that allows you to be an integral part of creating the design. We proactively help to determine the scope of your remodel. We discuss what is best for your home and budget and review the final design with you. We want to be certain we communicate how the scope affects project preparation, the construction calendar and ultimately, the total cost of your proejct. We firmly believe that the best pathway to a spectacular result is thoughtful design. 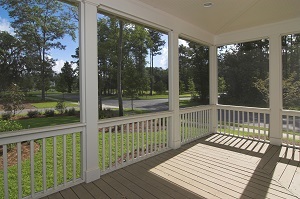 Your porch should fit your lifestyle, needs, and tastes. Our expert team can guide you through the process to ensure your project exceeds expectations! Get the porch of your dreams today! If a new screened-in or maintenance-free porch sounds like the perfect addition for your home, Outback Deck Inc. is here to help. Contact us today to see the difference a new porch can make! We offer no-obligation design consultations for all projects, so call us today and let us know how we can help you. We provide quality fence, deck, porch and patio design and installation in Acworth, Kennesaw, Smyrna, Canton, Atlanta and neighboring areas.